Math. I hate it. Really I do. I know, you are not supposed to say that, but it's true. I really thought that after I scraped by my math classes in school, that I was done, but that was not the case at all. Now that we are homeschooling, I'm right back in the thick of things with math, and it's still not fun for me. However, I really want it to be better for the boys, so I am going out of my way to try to find more fun and exciting ways to handle teaching math. Thinkfun offered me a chance to check out their super cool new Math Dice Powers game, and I was really excited to try it out! The most fun and elegant math skills game ever, now features exponents. 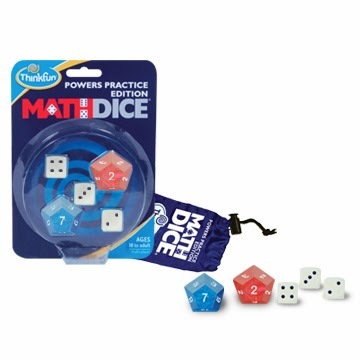 This Powers Practice Edition of Math Dice® encourages the use of exponents as you play! This Powers Practice Edition of Math Dice is actually really cool! My guy is still a bit too young to learn his powers, but I know it's going to come in really handy when we get to that point! We've practiced with the dice a little bit, and I really love the idea of them! Like I have mentioned before, my guy does so much better if he has a "hands on" approach to whatever we are learning, so this is absolutely perfect. We are still in the beginning stages of learning exponents, so we haven't gotten to really know this game as well as we will in the next few months, but I can tell that this would be a great asset for older kiddos! If you want to check out the other games that Thinkfun has, you can do so HERE. Also make sure to check out Thinkfun on Facebook and Twitter to get the inside scoop!